This orchid is very similar in appearance to Ophrys lutea although the plants and their flowers are significantly smaller. 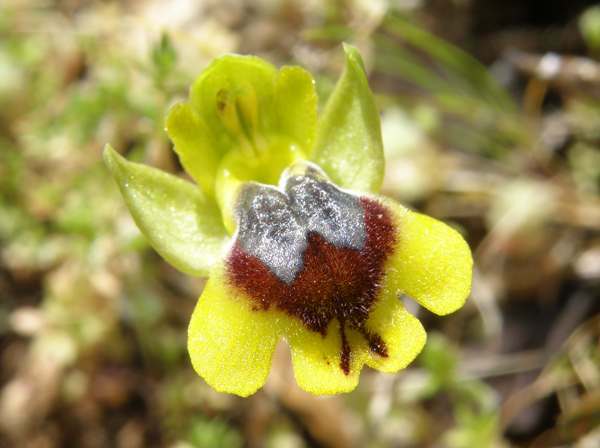 Ophrys lutea subsp. galilaea is very rare in the Algarve region of Portugal, where the larger Ophrys lutea is very common and widespread. In other parts of Europe this smaller flowered yellow bee orchid is more common than O. lutea and has been given a number of different names which include Ophrys phryganae and Ophrys sicula. In the southern Balkans, Greece, Crete and Corfu another similar-looking orchid has been recorded and is recognised as a subspecies of Ophrys lutea - Ophrys lutea subsp. melena. It is often referred to simply as Ophrys melena. Its attractive flower has a much browner lip with a yellow 'stripe' running along the outer edges. In some central and eastern parts of its range Ophrys galilaea flowers alongside Ophrys lutea adding to the confusion with accurate identification. The plant grows up to 25cm tall but is often smaller, and the lax inforescence carries between 2 - 10 flowers. The sepals are green and the petals yellowish-green. The lip has a brown centre which often terminates at the tip with a shape resembling a swallow tail. The speculum is usually dull grey-to-blue and somehwat 'bumpy' in appearance, particularly at the base where it emerges from the stigmatic cavity. The flowers stand out strongly from the stem. 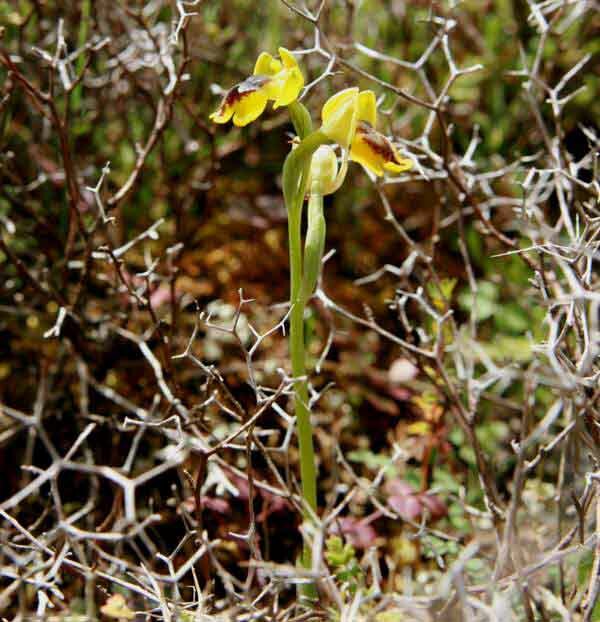 This orchid grows in open sunny positions in the stony areas with alkalkine soils often referred to as garrigue, littoral or, in Greece, the phrygana. A flower of Ophrys lutea subsp. galilaea shows the 'swallow tail' at the base of the brown centre of the lip and the bumpy appearance of the speculum. It is the wide variation in the appearance of some Ophrys species that makes identification so problematic. This orchid flowers from the end of March to the beginning of May.